On day 18 of our trip, we left Big Bear Lake happy and full! Our hostel had a shared kitchen, so Garrett had a double breakfast of granola, then hot ramen. I heated-up my leftover Indian food from the night before (paleek paneer and naan). And we had coffee! With some substantial nourishment under our belts, we took the hostel’s shuttle (a 1991 station wagen, complete with those reverse facing seats in the back) where we left the PCT at mile 266. We hiked 8 effortless miles, and surprised ourselves when we reached the water source so quickly. The rest of the afternoon we took it a bit slower, and started are descent down from yet another mountain. We passed a lot of wild flowers along the way. 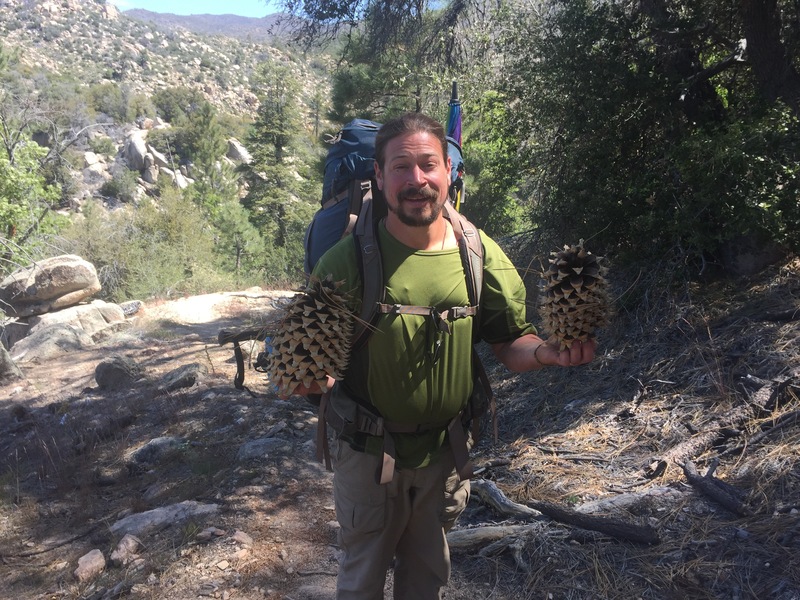 We left the pine forest again, and with it we said a goodbye to the gigantic pine cones we’ve been seeing. As we hit 20 miles, we expected there to be a small steam. All of our info told us that there should be a good flow, but alas it was dried-up. We needed water, so we pressed on further down the stream, and luckily it was flowing there! 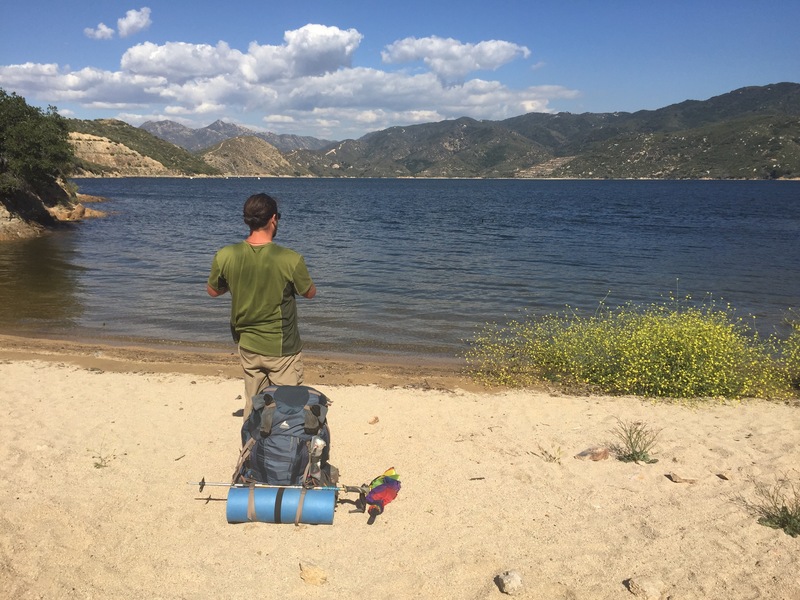 It was a tense few miles, and we made camp shortly there afterward and called it a night. The next day promised to be full of water, as we were walking along the side of a ravine most of the next day next to Deep Creek. It was relaxing to hear and see water most of the day, considering our experience the day before. That night, we even got to have a wet camp; meaning, we camped by water. It was great to stick our feet in the water after two long days of hiking. The blisters are getting better, and the temperatures have been cooler, which have helped us up our miles per day. As we were eating our dinner that night, a helicopter started circling the area right above us. It was a rescue helicopter, and we saw it hover over the hill across the creek. Someone repelled down, and after a few minutes the helicopter pulled someone up in a seat. 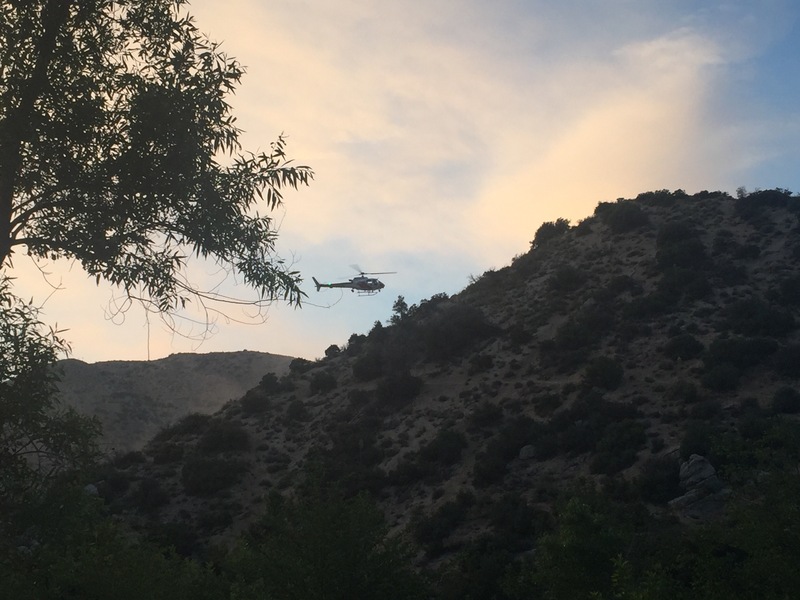 We read later in the news that a hiker going down to the nearby hot springs fell, and fortunately only suffered a “non-life threatening injury.” Watching the rescue happen certainly made it an interesting night, and we’re relieved to hear the hiker is okay! 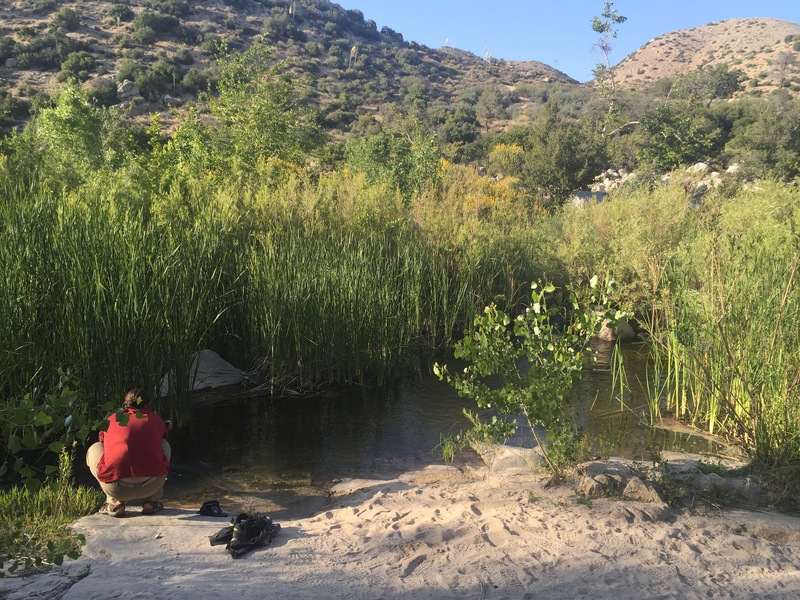 We woke-up the next morning with a goal to make it to Silverwood Lake, 21 miles away. 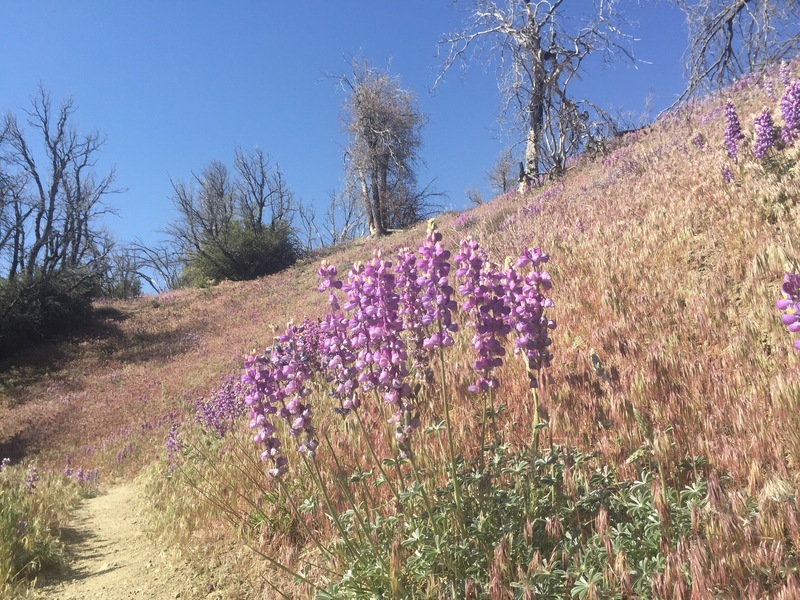 We started along the ravine again, and came out a few miles later near the Mojave reservoir spill-way. Shortly there after, the trail became quite exposed to the sun, and we could tell that we would be returning to the hot temperatures! There was water at 5, and 10 miles into our hike, so we were able to carry a lighter load of water for the first half of the day. 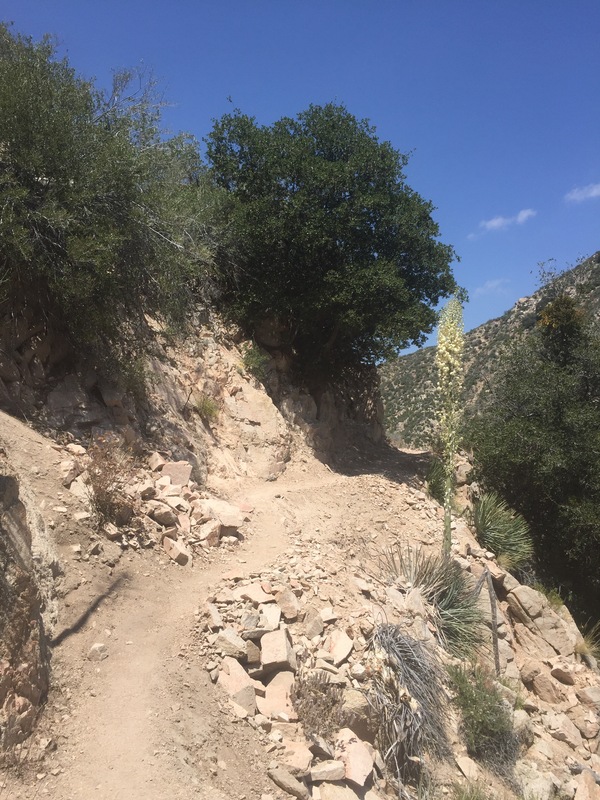 The next 8 miles were in the hot afternoon sun, and I was starting to wonder if I’d be able to make it the last few miles to the lake when we ran across some trail magic! Just as we found the first bit of shade in a long while, there was a cooler with cold water, oranges, and other treats. We split an orange, and had some cold water, and felt rejuvenated to make it to the campground at the lake! We were surprised a mile later to find some small beaches right on the lake, and we took the opportunity to further cool down with a quick dip! The last few miles to the campground were nice and breezy, as we circled around the lake to the other side. It was a great end to the day, and we found a pretty spot under some trees to pitch our tent. We’ve been spoiled with water these past few days, which is a nice, as were starting to approach the real desert! This is great, having a “remote adventure” with you. I loved the giant pine cones. And all of your photos. I did miss you mightily at the cafe on Sunday. Sad little thin brown things passing for vegan pancakes. Sigh. You guys are amazing. I was considering the possibility that I could actually handle the 9 mile Harpswell hiking challenge. You guys do that before breakfast! Do the challenge, you totally can! I know it’s no surprise, but it is one of my favorite events in Harpswell! i can’t imagine your fortitude as you continue your journey! Thanks for such a wonder fiull report. It reminds Susan and me of a canoe trip we took through part of the Lewis and Clark journey. When we arrived at a portage a beautiful Native American boy handed us each a cold bottle of water – we’ve never tasted anything quite so delicious . . . Cheers to you both and know we’re sending you waves of good energy! Thanks, Adam! We’re picking-up on the good vibes! Please give our best to Susan!